And so it begins. 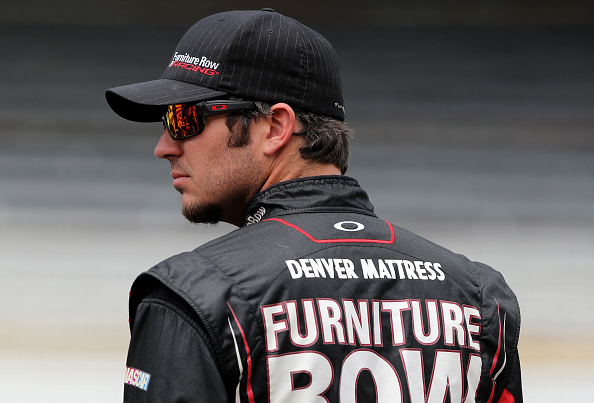 The 2016 Chase for the Sprint Cup field has been set. The 16 drivers all have a chance to go all the way to the final race at Homestead and be among the Final 4 to win the season title. To do that however, a driver must survive the cutoff of each round. The best way to do that is to win one of the three races in each of the three rounds. That chance starts this Sunday with the first race in the Chase the Teenage Mutant Ninja Turtles 400 at Chicagoland Speedway. While any of the 40 driver field could win, the winner will probably come from the field of 16. Of the last 11 races, 10 of those were won by drivers in this year’s Chase field. Here are my favorites for Sunday’s 27th race of the year for your betting or fantasy racing leagues. 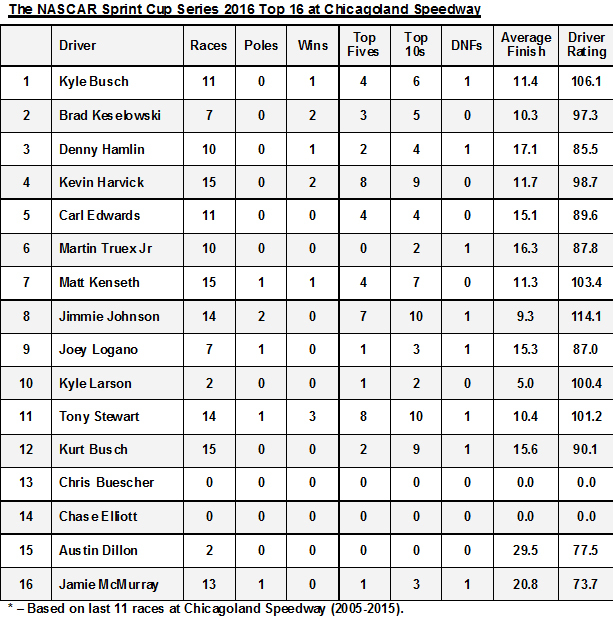 Driver Ratings compiled from 2005-2015 races (11 total) among active drivers at Chicagoland Speedway. The Driver Rating is a number based on a formula developed by NASCAR which combines “loop data” elements such as average running position, average speed under green, number of fastest laps, and other stats. There is a maximum of 150 points that a driver can earn for each race. The odds are current as of Wednesday. Jimmie Johnson (12-1) has had some miserable weeks leading up to the Chase. He’s never won at Chicagoland, but he was part of a test here in August. He holds the highest driver rating in the field, 114.1 and didn’t win six titles without knowing how to respond under pressure. He is somewhat of a long shot but a reasonably safe bet. Kyle Busch (7-1) led a race high 121 laps in this race last season, only to see lat race pit strategy derail his hopes for a win. He did win here in 2008 however, and has the second highest driver rating in the field, 106.1. 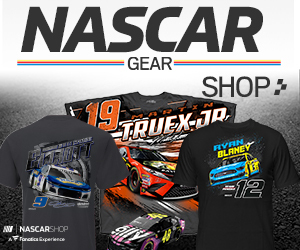 With the way the Joe Gibbs Racing Toyota’s have been dominating of late, Busch could add another Chicagoland win to his resume Sunday. Matt Kenseth (8-1). Speaking of JGR drivers, Kenseth has a pole and a win here and the third highest driver rating in the field 103.4. He was fifth in this race last year and after the Chase run he had in 2015, will be looking to make a strong statement right out of the box. Kurt Busch (12-1) led 37 laps last year and finished third. Busch has never won here, and has the ninth highest driver rating in the field, 90.1, but his performance late in the going last year can’t be overlooked. Brad Keselowski (10-1) has two wins here, the last coming just two years ago. He has the eighth highest driver rating in the field, 97.3. With the experience of winning twice, Keselowski could be a surprise winner on Sunday. OTHERS: Kevin Harvick (5-1) is the odds makers favorite. He does have two wins here ,but the last came in 2002. He has the seventh highest driver rating in the field, 98.7, but will need to overcome the bad luck that has plagued him recently if he hopes to add a third. Tony Stewart (35-1) leads all active drivers with three Chicagoland wins. He has the fourth highest driver rating in the field, 101.0, and is a sentimental favorite, but will have to stage a stellar run Sunday. He could pull off a win, but odds are against it. 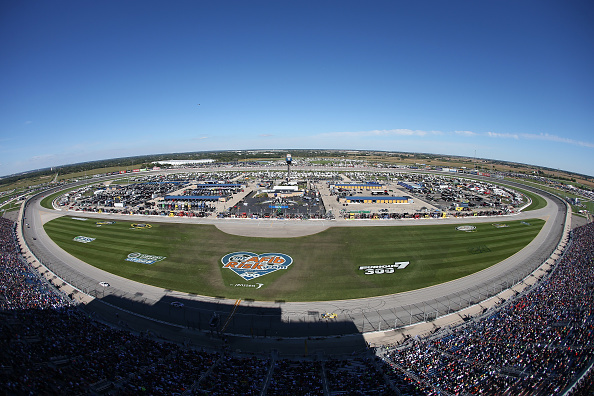 The NASCAR Sprint Cup Teenage Mutant Ninja Turtles 400 at Chicagoland Speedway will be run on Saturday September 18. Live coverage will be on the NBC Sports Network starting at 2:00 p.m. ET with the green flag coming just after 2:30 p.m. ET.